Do you have the winter blues? My advice is to take a snow day with your entire family! Growing up, winter was one of my favorite seasons. I remember major winter snowstorms. At times it snowed so much that it covered the fence in our yard. Our dog was delighted as he could walk up one side of the snow bank and down the other to get out. My brother and I would stay outside, as much as humanly possible, playing in the snow, building forts and having snowball fights with the neighbor kids. Our youth group went sledding at a nearby park where toboggans set the course for a speedy trip down the hill on our sleds. There was nothing better than waking up to a school closing on a snowy winter day! As I grew older, my love for winter began to dwindle. Somewhere along the line, I began to dread winter. Sure, I enjoyed a brief visit outside with my boys on the occasions that we got snow. 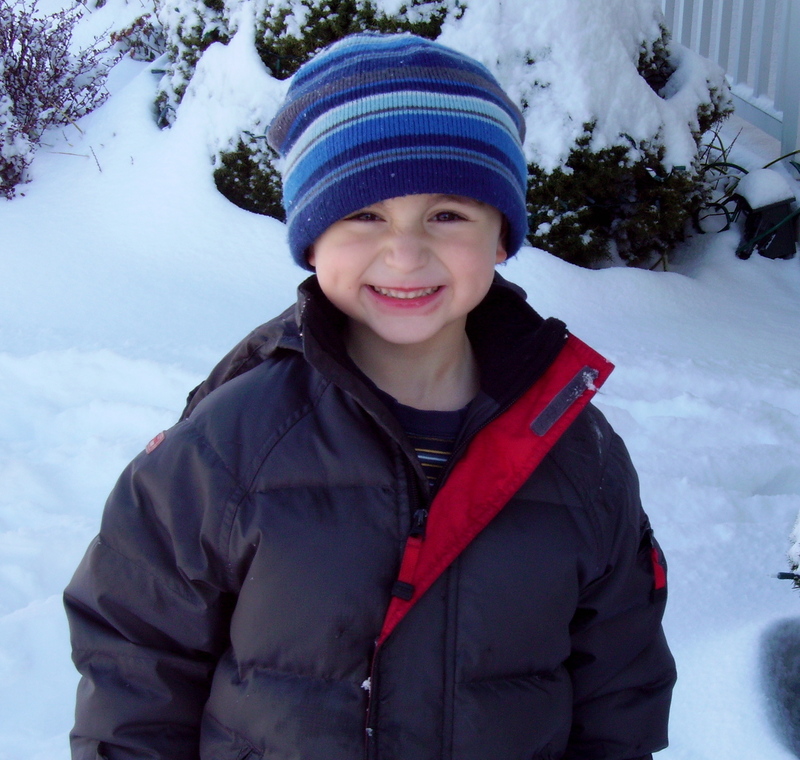 And, I’ll have to admit, the snow pictures I have taken of the boys over the years are the cutest shots ever!! Crinkled Nose and Chapped Lips…PRICELESS!! …But, January and February (for me) were months to be dreaded. 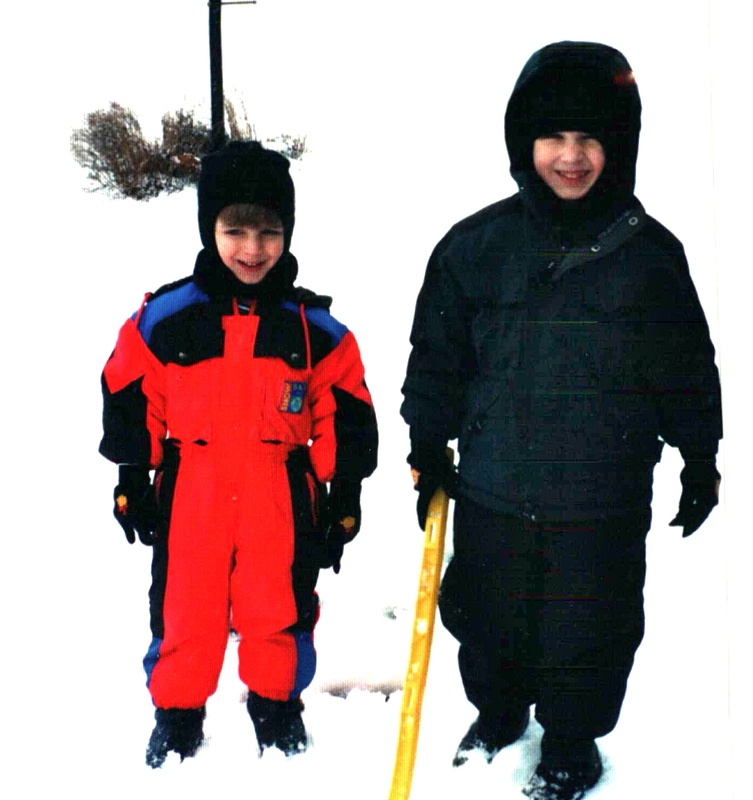 Then, one year for Christmas, the boys received gift cards to our local ski resort. The giver’s intent was for us to use the gift towards snow tubing (aka sliding down a snowy slope on an inner tube) since none of us were skiers. That winter we had a beautiful snowfall on March 16. The next day, Saint Patrick’s Day, we headed up to the ski resort, and I discovered a way to begin enjoying winter once again. Snow tubing requires absolutely no experience but delivers big on fun! This may sound funny to those who are “seasoned” skiers, but I thought that in order to go snow tubing there had to be natural snow on the ground. Once we got there, we discovered another world! As long as the temperatures cooperate, the ski resort can actually make snow. I wish I had pictures of that first snow tubing adventure (camera batteries were dead). It was certainly a memorable day for all! After that first outing, it occurred to me that the reason that I stopped enjoying winter was that I was hibernating during the winter months. I wasn’t outside enjoying nature and breathing in the fresh air. 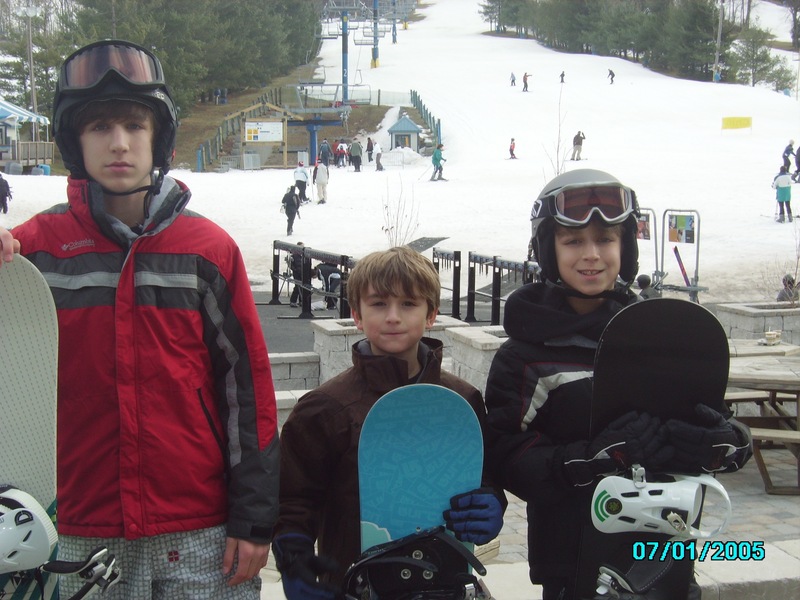 The next year, I learned to ski and the boys learned to snowboard. We made time to get outside and enjoy the beauty of the season! I’ll be honest with you, skiing can be an expensive sport, but it doesn’t have to be. If you are new to skiing and snowboarding the “learn to” packages can’t be beat! They allow you to try the sport without spending a lot of money. Click here for SkiPA, a website that addresses the beginner skier. Do you have a 4th or 5th grader? College student? Also from SkiPA: “How about skiing or boarding for FREE this winter? Well here’s your chance! Your Pennsylvania 4th & 5th Grade Snowpass booklet offers you the privilege of skiing and boarding 21 Pennsylvania Ski Resorts for FREE this winter – Take mom or dad with you for the thrill of a lifetime – an experience you will never forget.” Click here for more info on this great offer. Our local ski resort, Ski Liberty, offers College Days on Wednesdays. For $35 the student with a valid college ID can ski for 4 hours including rental equipment AND lessons if needed. There are also deals to be had on snow tubing packages–click here for an example from Ski Liberty. And February 21 is our resort’s local appreciation day! “All residents of Fairfield, Gettysburg, Orrtanna, Cashtown, Carroll Valley, and Emmitsburg, MD are eligible for this special discount! Must bring valid photo ID to show proof of residence. Liberty is open for skiing & snowboarding from 9am to 10pm, and from 4pm to 10pm for snow tubing on Community Appreciation Day.” For more info, click here. The bottom line is that you can find less expensive ways to enjoy the slopes. Search on-line for the slope closest to you, and look on their website to find the best times to visit. Many slopes even have webcams so that you can see the conditions ahead of time. Here is our local resort’s link for their webcams. If your winter boots aren’t up to date, many snow tubing venues actually rent boots! Also, don’t forget to check the consignment and thrift shops to outfit the kids (this is a great tip whether you’re planning on skiing or not;-). In addition, if you discover that you would like to purchase ski or snowboarding equipment for yourself or the kids, the fall is a great time to buy second-hand equipment at local ski swaps. Finally, If you’re lucky enough to have natural snow, get some inexpensive sleds or even inner tubes and hit a local hill. 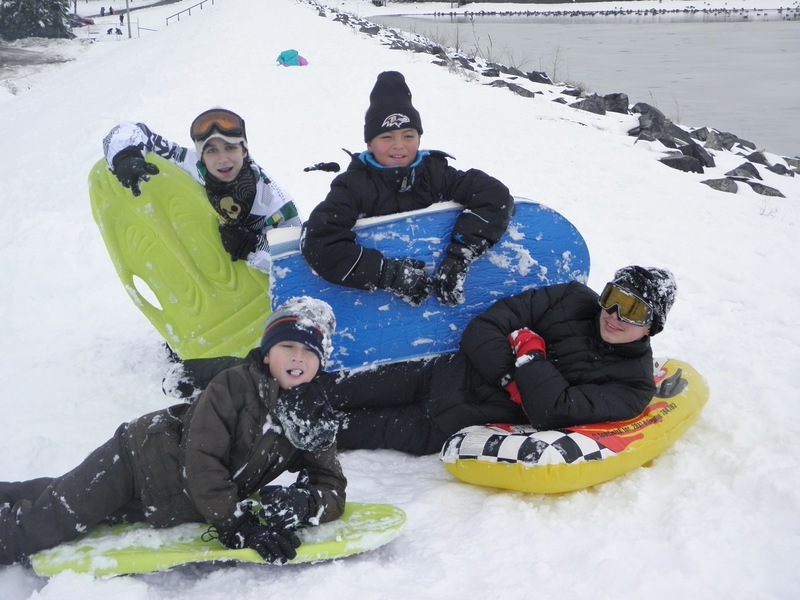 Even though the boys have learned to snowboard, they still enjoy sledding with friends! How does your family celebrate winter? Feel free to share your tips for family skiing, snow tubing, and other ways of enjoying the winter season, below.